ADOBE ANALYTICS REPORTING · 6-MINUTE READ · By Supermetrics on June 15 2017. We get unreasonably pumped every time we release a new connector. Each one of them gets us one step closer to cover all the data sources our users want to connect. With that in mind, you can imagine how excited we are to introduce our connector for Adobe Analytics (formerly known as Omniture SiteCatalyst), one of the top alternatives to Google Analytics. Why use our Adobe Analytics Connector? Let’s face it, there is no one-size-fits-all way of reporting in digital marketing. You often want to create reports which are specific to your needs. Exporting your data into Google Sheets is a perfect solution for this scenario. You’ll have total control over the data once they’re pulled into Sheets. After the reports are created, you can also schedule automatic refreshing to make sure they’re always up to date. Another use case is ad-hoc analysis. Exporting data into Google Sheets is a simple way to quickly perform analyses which are not available through native reporting UI. You’re able to process and analyze the raw data in any way you want, e.g. with formulas and pivot tables, to extract insights. Another major benefit is that you can combine Adobe Analytics data together with data from 30+ other sources. PPC, SEO, social, email, you name it. For example, if you run paid campaigns on Facebook, you may want to know what those visitors do after they land on your site. Or even better you can analyze the behavior of the best-converting segment of visitors. Just pull data from Facebook and Adobe Analytics to see the full picture. Also you can link your Adobe Success Events back to different channels. Use those micro-conversions to better understand the value of your traffic. If you want to use your Adobe Analytics data in dashboard tools such as Google Data Studio or BI tools like Tableau, Google Sheets can be the easiest workaround since most of them do have a Google Sheets connector. A teaser for you if you want to pull Adobe Analytics into Tableau. We’re beta testing a native connector for Tableau. Hit us up at support@supermetrics.com if you’re interested in early access. It’s very simple. If you don’t yet have the Supermetrics add-on, install it from the Chrome Store. Then launch the sidebar, choose Adobe Analytics from the data source list, connect to your Adobe account with either your Adobe ID or your username + shared secret. You will find more detailed instructions on logging in from our Connecting to Adobe Analytics knowledge base post. To use the full power of Adobe Analytics, you need customization. In an account, you can create up to 75 custom traffic and conversion variables as well as 100 custom events. By using custom traffic variables with relevant dimensions you can get great insights: e.g. by splitting Visits metric by Site Section you can see how many people viewed a particular section of your website. Check out this blogpost by Digital Balance to learn more about building custom reports. Also, take a look at Adam Greco’s blogpost on Analytics Demystified to make sure you are using the power of segmentation to its fullest in your reports. Segments allow to see what customer groups are performing best and allocate the budget to convert the ones with most potential. If you already use Google Analytics and are new to Adobe Analytics, this beginner’s guide to Adobe Analytics by Kevin Butter is a good starting point for your learning. Our Finnish fellow Antti Koski has compiled two rather comprehensive cheat sheets to help you get up to speed. 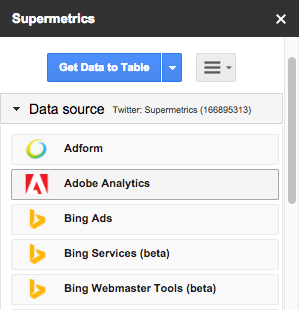 The Adobe Analytics connector is available now in the Supermetrics Google Sheets add-on. If you have any suggestion for improvement or would like to share how you use the connector, hit us up!